In 1995, we didn’t know what above-the-fold meant. While UX design didn’t formally exist, technological limitations forced us into restrictive designs. We were doing our best to add width to Web pages using things like “spacer-GIFs”. As we started to get more sophisticated (which didn’t take much), we developed other website design concepts like a bandwidth budget and above-the-fold design. Spacer-GIFs disappeared with the advent of tables in HTML code. I think we only used them for about two years. Man – it was an ugly time – it would be wrong to use the words “website design” to describe the shite we were building. We created bandwidth budgets for each page because people accessed our website (Insight.com) using modems – it was painfully slow. The HTML and the graphics needed to be under 85K for each page (and that was pushing it). Today, we’re streaming video, large high-resolution graphics, and complex code – and people can yank that content down with their mobile devices. It’s still important to make your site as fast as possible, but the budget can be considerably larger. People are going to access your website from a number of different devices – with a virtually unlimited set of screen sizes and resolutions. That is why we’re using responsive website design as an attempt to provide a better UX regardless of how you access the content. The majority of visitors are using modern mice which detect scrolling. When the Above-The-Fold design mentality arrived, nobody scrolled. Scrolling required the visitor to move their cursor to the right side, wait for a scroll-bar to appear, then left-click and hold as you dragged the page downward. Now, with a small flick of the finger, a visitor can plunge to the depths of any Web page. 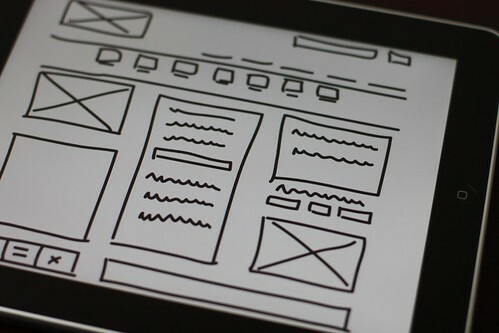 Take a UX design cue from the big guys. My favorite, current example of Web page design that smacks the Above-The-Fold design is from Apple (clearly a large and influential design company). [When this post was initially published, Apple had a huge image for the iMac product page. It was designed to show off resolution. And, if you wanted to learn more – you scrolled. We used to have link to that page, but the demonstrative UX content is no longer there. Added by John-Scott Dixon on 12/09/2017] If that doesn’t convince you that Above-The-Fold design restrictions can be relaxed or dismissed, I don’t know what will. To be fair, after three seconds – it will prompt you to scroll. If you need help implementing the concepts discussed within this blog post – as always you can reach out to us at marketing@aidantaylor.com. The SEO keyword for this post is: website design. Dismissing Above-The-Fold Design as a UX Best Practice by John-Scott Dixon is licensed under a Creative Commons Attribution-NonCommercial-NoDerivs 3.0 Unported License.